AX02. Conical Nesting dolls Ukraine USSR 6n, 6.75"
This is a vintage set of 6 Russian Matryoshka dolls from the Ukrainian region of the USSR from the 1980's. The dolls are approx 1 1/2" to 6 3/4" tall and in excellent condition except for some paint peeling on the 4th doll - the yellow paint on her head is peeling. The 3rd sticks inside the 2nd unless you keep a ribbon between them. 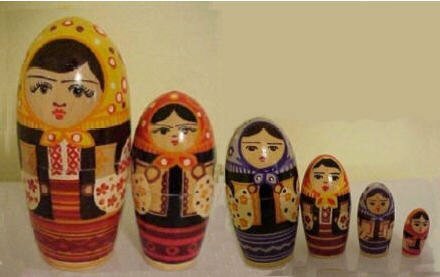 These were the last few dolls of the seller’s personal collection of Russian Matryoshka nesting dolls. Conical Ukrainian dolls like these are hard to come by.